Tangentially related to this year’s resolution! Do you remember what it is? Happy Monday, Noshers! If you followed this blog last year, you’ll know that I set (and achieved!) a goal to try 20 different vegetable recipes. I set that goal for myself because I really was not a veggie fan – I didn’t despise veggies, but let’s just say I’d be happy if I never ate them. Thanks to that resolution (and joining a CSA!) I discovered several new veggies that I absolutely love, as well as gained knowledge on how to tell if vegetables are ripe and/or in season. Based on last year’s experience, I’d like to set a new resolution to achieve in 2012! I’m not going to go all out and say healthy, because I’m a big dessert person, haha. But this semi-healthy quality led me to rule out making 12 types of cupcakes or 12 types of whoopie pies. Oh well, maybe next year, ha! There were some really great suggestions from readers that I’d love to try; however, they would require me to either 1. purchase large amounts of an ingredient I’d use maybe once or 2. spend a lot on lots of different ingredients. I’d preferably like to keep this resolution within a modest budget. Ideally, this goal will either make me more conscious of what I eat, save money, introduce me to new foods, save me time, or improve my kitchen skills. Or a combination of any of these! Based on the above, I reviewed all my options (thank you tweeps, for your suggestions!) and decided to go with…. I will make 20 different types of sandwiches in 2012! Thank you @RunningDoyle for this suggestion! This resolution is perfect for me this year – I’m trying to bring lunch to work more (which this goal will certainly help with) to save money and also to have a little more control over mindless lunching. I’ll also be getting a little creative with the traditional sandwich – exploring breakfast sandwiches, dessert sandwiches, and creative ingredients. I’m really excited about this! Hope you are too! Let’s get it started! What’s your favorite sandwich? Walkers Shortbread Dippers and 20% off All Products! Great resolution! 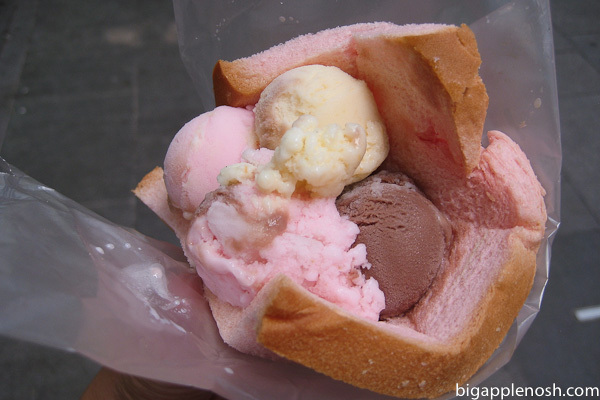 I remember that ice cream sandwich but can’t remember what the bread is made out of . . . something delicious, for sure. Can’t wait to see what sandwiches you come up with! Awesome! I can’t wait to see what creations you come up with! Great resolution! My fave sandwich would either be chicken and pesto or crab. great resolution! I love sandwiches and I’m a pro at bringing lunch to work now too. I can’t wait to see what you come up with! I love a good sandwich, especially if it is made in a new and exciting way! What a fun resolution! I’m a PB&J girl myself, but I got a panini maker as a wedding gift and I’ve also tried pesto and melty cheese in it! My faves are anything that involves pear – pear, gorgonzola and walnut on baguette or a panini with pear, proscuitto and a white cheese (maybe havarti?). There’s a sandwich I once had years ago in Albuquerque of all places that I still think about. It was shaved turkey breast, thin waffle-sliced granny smith apples and fennel. Also had a dessert sandwich involving baguette, nutella and bruleed strawberries. Yum. My new favorite sandwich is a southern-style one: grilled pimento cheese, fried green tomatoes and bacon. It’s unbelievable! This should be interesting! Can’t wait to see what you come up with. I love it! Sandwiches are so yummy, and I look forward to seeing what you make this year. Mmmmm! great resolutions! i’m working on eating more healthy, too.